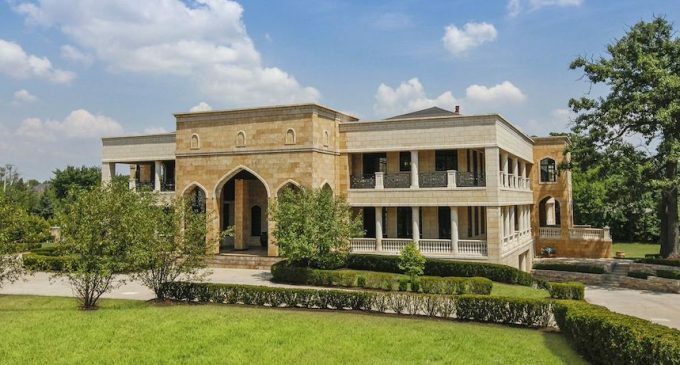 A 30,000 square foot mansion in Burr Ridge, Illinois is back on the market for $7,000,000 after selling to a bank trust in November of 2012 for $3,100,000. It’s known as Villa Taj and the home’s history is about as long as its amenity list. The palatial residence was the dream of dentist Husam Aldairi who ended up running into financial problems leading to bankruptcy. He put his dream on the market in 2009 for $26,500,000 before dropping it to $13,000,000 in August of 2010. With no interest, the property was removed from the market and sat vacant for a period of time. In March of 2011 an agent arrived to the mansion with a potential buyer to discover that several of the home’s water pipes had burst and completely flooded the place. The water could have been running for as long as three weeks before it was found. An estimated six million gallons of water flowed throughout the home which featured treasures brought in from all over the world including stairs made of Brazilian cherrywood, $2,000,000 worth of gold limestone from Israel and an Italian tile floor installed at $180 per square foot. The 30,000 square foot Villa Taj has now been fully repaired and back on the market for $7,000,000. The listing notes that it includes 8 bedrooms, 11 bathrooms, an additional 15,000 square feet of covered terraces, a gourmet kitchen, an extravagant ballroom with 38 foot conservatory ceiling, a panelled library and a heated 22 vehicle garage. Last year the Chicago Tribune reported that a man broke into the mansion, drank the homeowner’s liquor and caused water damage in one of the bathrooms. He was arrested on charges of trespassing. It’s currently listed for $7,000,000 with Lisa Petrik of Sotheby’s International Realty. Be sure to check out the home’s 3D walking tour here!